The first iPhone was released in 2007 and the first Android phone in 2008. Ten years later, smartphones are becoming ubiquitous. They now have more advanced sensors, cameras and more processing power, which have allowed several innovative apps to be made, which were not possible a few years ago. These apps will change the way we interact with patients and with clinical data, provide affordable and advanced testing, enhance the way we learn, and hopefully improve doctor–patient interactions. However, most of these apps are made without professional input and needvalidation before use. We try to review the current landscape of Smartphone Apps in Ophthalmology. With the proliferation of smartphones in every sphere of life, ophthalmologists are not left behind. 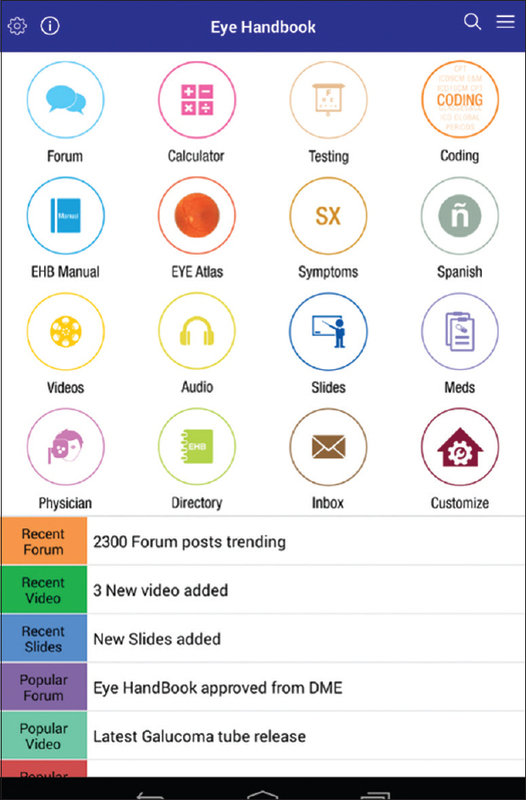 In addition to the general apps used for communication, group discussions, reminders, reading eBooks, etc., there are now several hundred apps specifically targeted at ophthalmologists, most of them released in the year 2015 and later. However, many of them are made without professional ophthalmologist involvement in development and finding a good app is difficult. The advantages of using smartphones are many. It is a matter of convenience as most ophthalmologists already carry a smartphone. Apps can be easily installed and uninstalled, and most of these apps are free. They have internal data storage and cloud storage capabilities built in. In fact, smartphones drive the majority of recent innovations in ophthalmology. High-resolution smartphone screens can help in assessing visual acuity with great accuracy. EyeNetra and Netra-G are smartphone-based autorefractors which use the high-resolution screens of modern smartphones to calculate refractive error using a headset. Gyroscopic sensors have helped in the development of toric intraocular lenses (IOL) marking apps. Better cameras have helped in smartphone slit-lamp and fundus photography. Several complex ophthalmic calculations, including IOL power calculations, are now possible on apps. Virtual reality (VR) perimetry uses smartphones inside a VR headset. There are several apps for ophthalmologists including patient testing apps, ophthalmic calculators, patient education apps, ophthalmologist education apps, ophthalmologist reference apps, eBook apps, electronic medical record apps, toric marker app, and capsulorhexis training. There are some apps, such as the Eye Handbook  [Figure 1], which do a variety of things such as comprehensive patient vision assessment, ophthalmic calculations, international classification of diseases, Vision Atlas More Details, and more. Many other apps are specialized in one or a few tasks only. Several apps help in assessing visual acuity (near  and distance), and a recent study concluded that in an emergency setting, visual acuity by a smartphone app is quite reliable  though the brightness and contrast of the smartphone screens and the optotype sizes have to be standardized. Unique in visual acuity apps is the Peek Acuity app  made for rapid mass vision screening which uses a tumbling E chart and unique gesture-based feedback. Here, the examiner swipes the smartphone screen in the direction the patient points and shakes the phone if the optotype is too small to be visible. This goes on until the app alerts that the visual acuity has been measured  [Figure 2]. 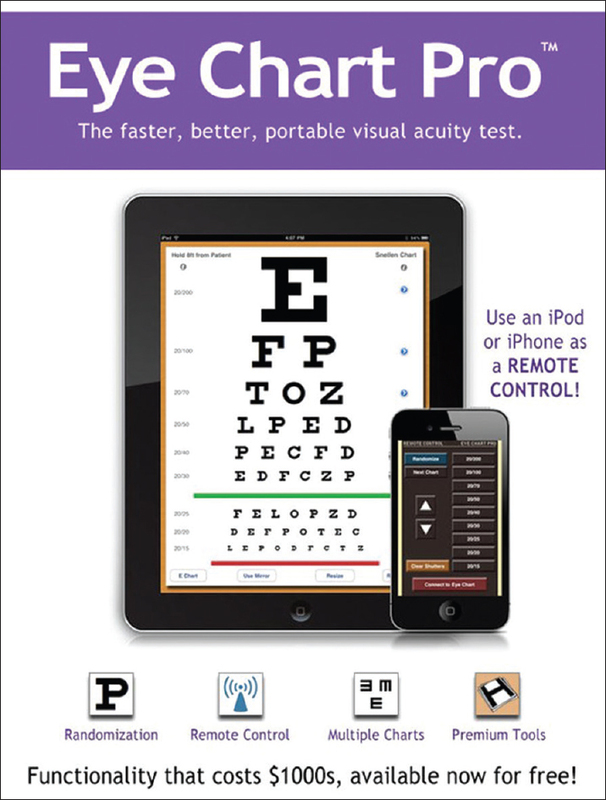 Another unique visual acuity app is the Eye Chart Pro  which pairs an iPhone to act as remote control for an iPad which acts as the display for the visual acuity chart [Figure 3]. There are several apps for color vision testing using Ishihara's chart which is quite useful; however, we need to be aware of their limitations  in sensitivity. Moreover, Ishihara's chart is only for the red-green color deficiency. The more accurate but lesser known Farnsworth–Munsell test is available in a few apps such as Color Blind Test  [Figure 4]. Some apps assess contrast sensitivity and color contrast also. ClinicCSF  is unique in that it measures contrast sensitivity using sinusoidal gratings. [Figure 5] Another contrast sensitivity testing app with option for both positive polarity and negative polarity testing was found to do better than the conventional printed chart. What is really unique is that there are some innovative apps such as Stereo Acuity Cardboard  which can assess stereo acuity, and depth perception using a smartphone-based VR headset such as Google Cardboard [Figure 6]. Dysphotopsia can also be measured with the Aston Halometer app, and a study showed comparable results as the C-Quant straylight meter. 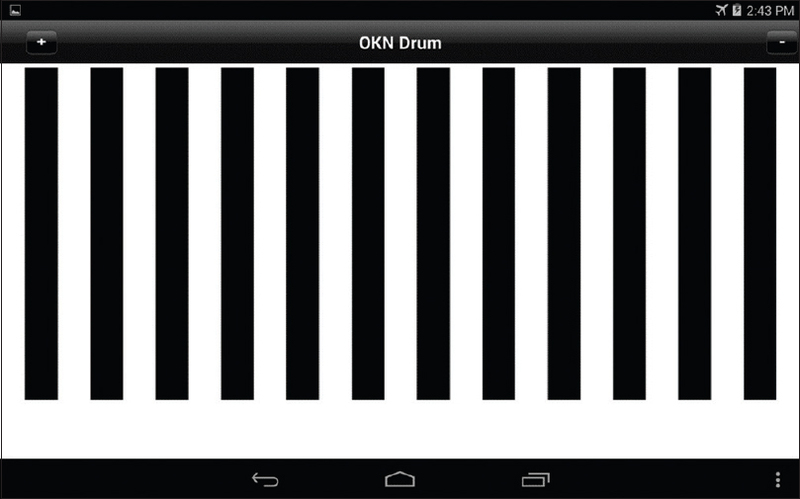 Some apps, such as Eye Handbook, OptoDrum, Adjustable Optokinetic Nystagmus (OKN) Strips, and OptoDroid, replicate the Optokinetic drum and can be used to test patients' OKN response [Figure 7]. Various calculations such as IOL power including toric IOL, surgically induced astigmatism, Visual acuity conversion from meters to feet, corrected IOP, and various optometric calculations such as transpositions can be calculated in the Eye Handbook app [Figure 8]. There are apps for manually grading LOCS III grade of cataract  and diabetic retinopathy. 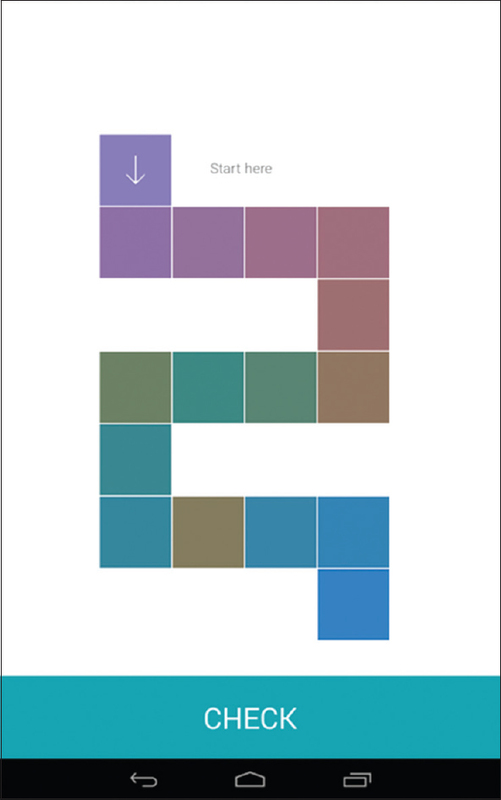 [Figure 9] There is even an app for Park's three-step test. A recently published study shows innovation in artificial intelligence -based grading of diabetic retinopathy from smartphone app. 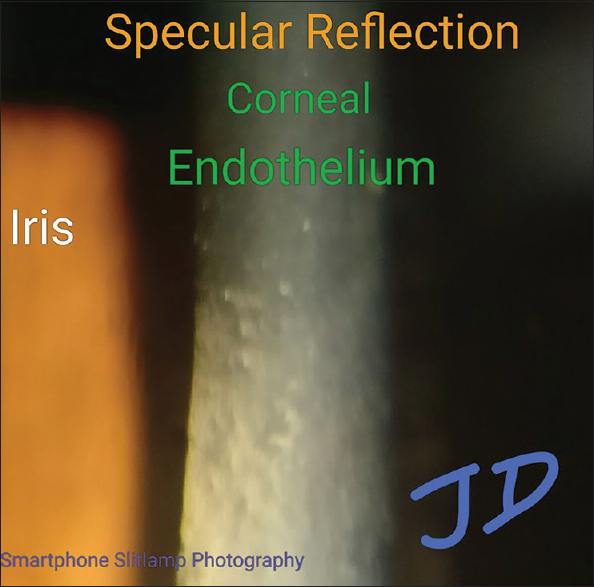 Slit-lamp photography is helped by affordable smartphone slit-lamp adapters. It can be also be used to take gonioscopy videos and even specular photographs of corneal endothelium  [Figure 10]. The technique of smartphone fundus photography has been described in detail by several authors with even open-source documentation for building your own smartphone fundus camera. However, one of the difficulties is that the inbuilt camera app is not ideal for the technique. 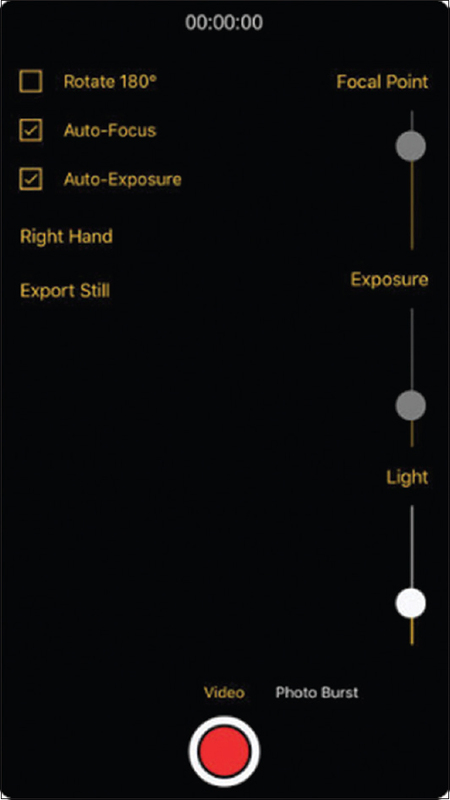 Ullman Indirect  for iPhone and several apps, including HopeScope  and Ullman Indirect on Android, have features such as inverted video, focus lock, and flash brightness control [Figure 11]. Tablet-based perimeters such as visualFields easy  and VR-based perimeters such as Periscreener  are in development and testing. Studies have been done on both tablet -based  and VR-based perimeters  and found promising results especially when conventional perimeters are inaccessible [Figure 12]. In addition to various eBooks and journals available as apps, there are some unique apps which help in learning ophthalmology. There is an app called cataract surgery, which is a simulator of capsulorhexis and phacoemulsification surgery. [Figure 13] Although it is a very basic app, it would be useful to explain to a fresh student of ophthalmology the intricacies of surgery in an interactive manner. A decision support app called OphthalDSS helped in clinical decision-making and was evaluated in a study. For clinical ophthalmology slit-lamp teaching, a smartphone connected SmartTV-based system was found to be better than the conventional slit-lamp teaching telescope which is restricted to one person at a time. For teaching ophthalmoscopy, another study evaluated a smartphone-based VR headset that had tasks incusing performing eye examinations and diagnosing disease and tests. Smartphone photographs can be used for screening for leukocoria; however, we need to be aware that false positives may also happen due to off-axis photographs. Screening of children for other risk factors for amblyopia can be done with the GoCheck Kids app with the smartphone attachment. Dry eye disease screening can also be done by apps which can give questionnaire and do a functional visual acuity test. There are now several apps on which we can set a medication schedule to ring an alarm and remind the patient to follow the correct dosing of medications. Some of these apps are EyeDrop Reminder, MyEyeDrops, eyeDROPS, and RxmindMe. [Figure 14] These are especially useful in chronic diseases such as glaucoma. 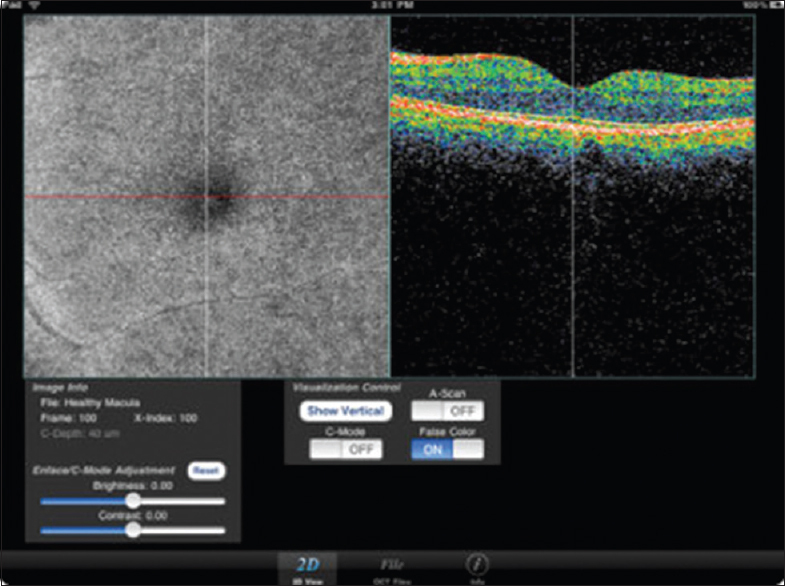 Optical coherence tomography (OCT) browser app  made by the University of Pittsburgh can be used to browse all the slices of a spectral-domain OCT in an iPad instead of being restricted to the OCT machine [Figure 15]. One study used the smartphone to measure anomalous and compensatory head positions. The availability of the gyroscopic sensor in newer smartphones made this easier and more accurate. Based on the same principle, there are apps to help mark the position for toric IOL insertion. There are vision simulator apps to show patients the type of vision to be expected in different types of IOLs and other apps to simulate vision due to glaucoma and diabetic retinopathy. There are VR versions of these simulators too. They can be accessed on mobile or desktop and show a 360° view of what is seen by a person with glaucoma, cataract, presbyopia, diabetic retinopathy, macular degeneration, and glare of varying degrees which we can select. [Figure 16]. Another study used a smartphone-based VR glaucoma visual function test to objectively assess activity limitation in glaucoma. There are also several amblyopia treatment apps which help to exercise the eye, however, a study noted that many of these apps are made without any professional input and so need to be assessed and validated. Language translator apps for ophthalmologists to communicate specific ophthalmology-related questions and phrases are also available in Tamil  and Bangla. Smartphone apps are rapidly evolving, and new innovative apps are being released often. However, many of the apps are made without ophthalmologists' guidance and are often not calibrated or validated for use. With currently available technology, we have the resources to make reliable and reasonably accurate apps for many components of ophthalmological evaluation at a much lower cost compared to conventional techniques. Cheng NM, Chakrabarti R, Kam JK. IPhone applications for eye care professionals: A review of current capabilities and concerns. Telemed J E Health 2014;20:385-7. Akkara JD, Kuriakose A. Review of recent innovations in ophthalmology. Kerala J Ophthalmol 2018;30:54. Gaiser H, Moore B, Pamplona V, Solaka N, Schafran D, Merrill D, et al. Comparison of a novel cell phone-based refraction technique (Netra-G) with subjective refraction. Invest Ophthalmol Vis Sci 2013;54:2340. Lord K, Shah VA, Krishna R. The eye handbook: A mobile app in ophthalmic medicine. Mo Med 2013;110:49-51. Tofigh S, Shortridge E, Elkeeb A, Godley BF. Effectiveness of a smartphone application for testing near visual acuity. Eye (Lond) 2015;29:1464-8. Perera C, Chakrabarti R, Islam FM, Crowston J. The eye phone study: Reliability and accuracy of assessing Snellen visual acuity using smartphone technology. Eye (Lond) 2015;29:888-94. Pathipati AS, Wood EH, Lam CK, Sáles CS, Moshfeghi DM. 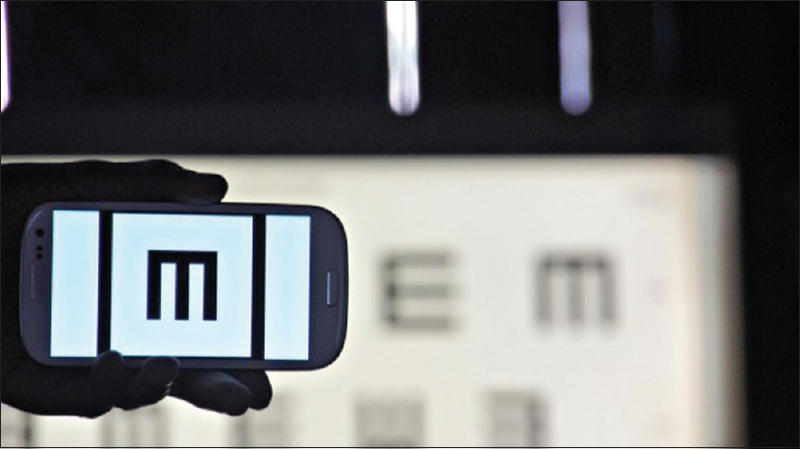 Visual acuity measured with a smartphone app is more accurate than Snellen testing by emergency department providers. Graefes Arch Clin Exp Ophthalmol 2016;254:1175-80. Peek Acuity – Apps on Google Play. Available from: https://www.play.google.com/store/apps/details?id=org.peekvision.public.android&hl=en. [Last accessed on 2018 Jul 20]. Rono HK, Bastawrous A, Macleod D, Wanjala E, DiTanna G, Weiss HA, et al. Smartphone-based screening for visual impairment in Kenyan school children: A cluster randomised controlled trial. Lancet Glob Health 2018;6:e924-32. Eye Chart Pro-Test Vision and Visual Acuity better with Snellen, Sloan, ETDRS, and Near Vision Exams! On the App Store. App Store. Available from: https://www.itunes.apple.com/us/app/eye-chart-pro-test-vision-visual-acuity-better-snellen/id364802332?mt=8. [Last accessed on 2018 Jul 20]. Dain SJ, AlMerdef A. Colorimetric evaluation of iPhone apps for colour vision tests based on the Ishihara test. Clin Exp Optom 2016;99:264-73. Sorkin N, Rosenblatt A, Cohen E, Ohana O, Stolovitch C, Dotan G. Comparison of Ishihara booklet with color vision smartphone applications. Optom Vis Sci 2016;93:667-72. Birch J. Efficiency of the Ishihara test for identifying red-green colour deficiency. Ophthalmic Physiol Opt 1997;17:403-8. Color Blind Test-Apps on Google Play. Available from: https://www.play.google.com/store/apps/details?id=com.eyeexamtest&hl=en. [Last accessed on 2018 Jul 20]. Clinic CSF on the App Store. App Store. Available from: https://www.itunes.apple.com/in/app/cliniccsf/id579919783?mt=8. [Last accessed on 2018 Jul 20]. Hwang AD, Peli E. Positive and negative polarity contrast sensitivity measuring app. Electron Imaging 2016;16:1-6. 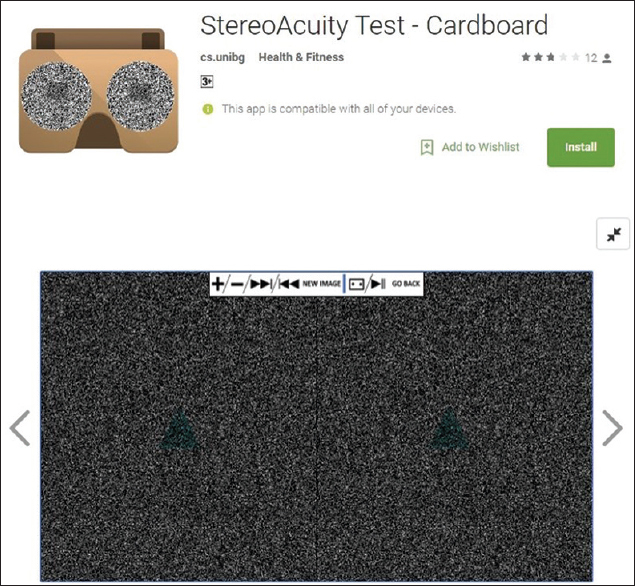 Stereo Acuity Test-Cardboard-Apps on Google Play. Available from: https://www.play.google.com/store/apps/details?id=it.unibg.p3d4amb.stereoacuitytest&hl=en. [Last accessed on 2018 Jul 20]. Buckhurst PJ, Naroo SA, Davies LN, Shah S, Buckhurst H, Kingsnorth A, et al. Tablet app halometer for the assessment of dysphotopsia. J Cataract Refract Surg 2015;41:2424-9. LOCS III APK Download – Free Medical APP for Android. Available from: https://www.apkpure.com/locs-iii/appinventor.ai_Yorkito.LOCS. [Last accessed on 2018 Jul 20]. Parks Three Step on the App Store. App Store. Available from: https://www.itunes.apple.com/us/app/parks-three-step/id858953524?mt=8. [Last accessed on 2018 Jul 20]. Xu X, Ding W, Wang X, Cao R, Zhang M, Lv P, et al. 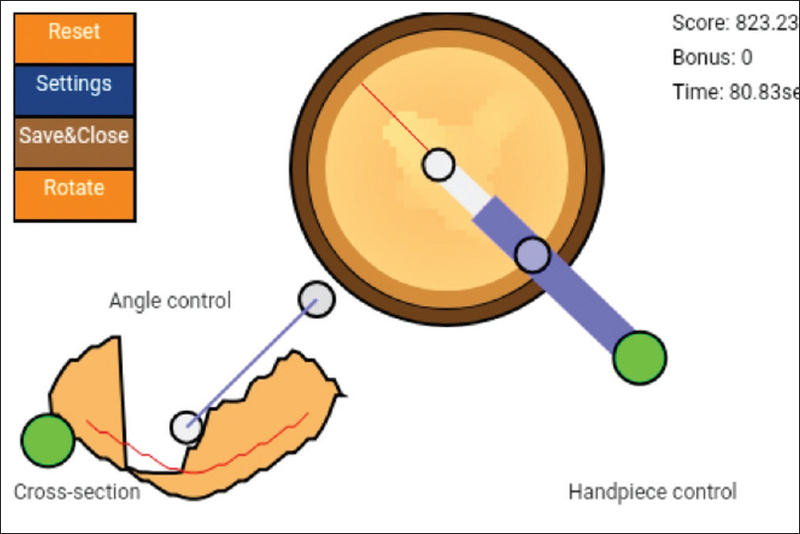 Smartphone-based accurate analysis of retinal vasculature towards point-of-care diagnostics. Sci Rep 2016;6:34603. Toslak D, Thapa D, Erol MK, Chen Y, Yao X. Smartphone-based imaging of the corneal endothelium at sub-cellular resolution. J Mod Opt 2017;64:1229-32. Raju B, Raju NS, Akkara JD, Pathengay A. Do it yourself smartphone fundus camera-DIYretCAM. Indian J Ophthalmol 2016;64:663-7. Ullman Indirect on the App Store. App Store. Available from: https://www.itunes.apple.com/us/app/ullman-indirect/id1243282866?mt=8. [Last accessed on 2018 Jul 20]. Hope Scope – Apps on Google Play. Available from: https://www.play.google.com/store/apps/details?id=com.nsdraju.hopescope&hl=en. [Last accessed on 2018 Jul 20]. Ullman Indirect – Apps on Google Play. Available from: https://www.play.google.com/store/apps/details?id=com.ullman.ullmanindirect&hl=en. [Last accessed on 2018 Jul 20]. Visual Fields Easy on the App Store. App Store. Available from: https://www.itunes.apple.com/us/app/visualfields-easy/id495389227?mt=8. [Last accessed on 2018 Jul 20]. VT138: Peri-Screener – Smartphone Based Virtual Reality Device for Perimetry – AIOC 2018, Coimbatore; 2018. Available from: https://www.proceedings.aios.org/2018/vt138/. [Last accessed on 2018 Jul 20]. Johnson CA, Thapa S, George Kong YX, Robin AL. Performance of an iPad application to detect moderate and advanced visual field loss in Nepal. Am J Ophthalmol 2017;182:147-54. Prea SM, Kong YX, Mehta A, He M, Crowston JG, Gupta V, et al. Six-month longitudinal comparison of a portable tablet perimeter with the Humphrey field analyzer. Am J Ophthalmol 2018;190:9-16. Tsapakis S, Papaconstantinou D, Diagourtas A, Droutsas K, Andreanos K, Moschos MM, et al. 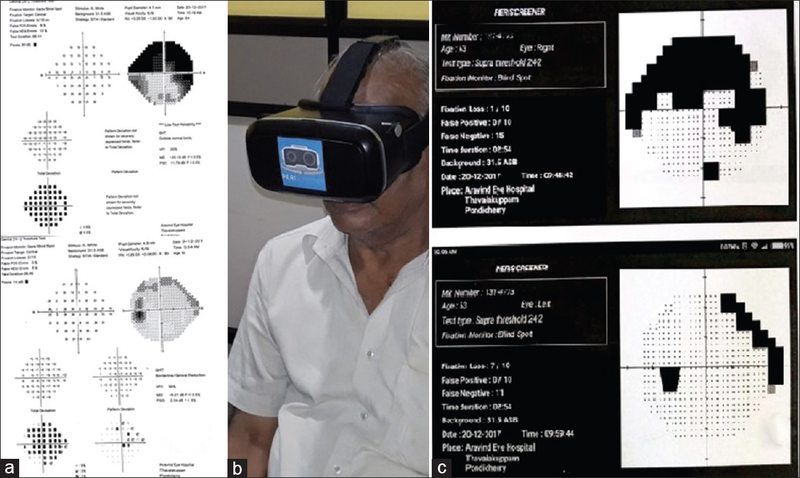 Visual field examination method using virtual reality glasses compared with the Humphrey perimeter. Clin Ophthalmol 2017;11:1431-43. Cataract Surgery on the App Store. App Store. Available from: https://www.itunes.apple.com/us/app/cataractsurgery/id482530875?mt=8. [Last accessed on 2018 Jul 20]. López MM, López MM, de la Torre Díez I, Jimeno JC, López-Coronado M. MHealth app for iOS to help in diagnostic decision in ophthalmology to primary care physicians. J Med Syst 2017;41:81. Wenting SZ, Samin MM, Sanjay S, Neelam K, Shibli K, Chang S, et al. A comparison of undergraduate clinical ophthalmology learning methods: Smart phone television display versus slit-lamp teaching telescope. Can J Ophthalmol 2017;52:385-91. Wilson AS, O'Connor J, Taylor L, Carruthers D. A 3D virtual reality ophthalmoscopy trainer. Clin Teach 2017;14:427-31. Asensio-Sánchez VM, Díaz-Cabanas L, Martín-Prieto A. Photoleukocoria with smartphone photographs. Int Med Case Rep J 2018;11:117-9. Peterseim MM, Rhodes RS, Patel RN, Wilson ME, Edmondson LE, Logan SA, et al. Effectiveness of the GoCheck kids vision screener in detecting amblyopia risk factors. Am J Ophthalmol 2018;187:87-91. Uchino M, Kawashima M, Uchino Y, Suzuki N, Mitamura H, Mizuno M, et al. 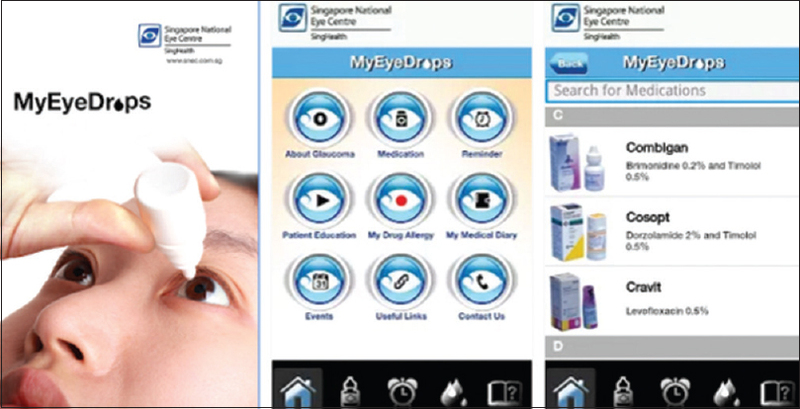 The evaluation of dry eye mobile apps for screening of dry eye disease and educational tear event in Japan. Ocul Surf 2018. pii: S1542-0124(17)30370-1. Eye Drop Reminder Lite – Apps on Google Play. Available from: https://www.play.google.com/store/apps/details?id=com.sathyaneyecare.eyedropremainderlite&hl=en. [Last accessed on 2018 Jul 20]. OCT Browser on the App Store. App Store. Available from: https://www.itunes.apple.com/us/app/oct-browser/id368039317?mt=8. [Last accessed on 2018 Jul 20]. Farah ML, Santinello M, Carvalho LE, Uesugui CF, Barcellos RB. Using a smartphone as a tool to measure compensatory and anomalous head positions. Arq Bras Oftalmol 2018;81:30-6. 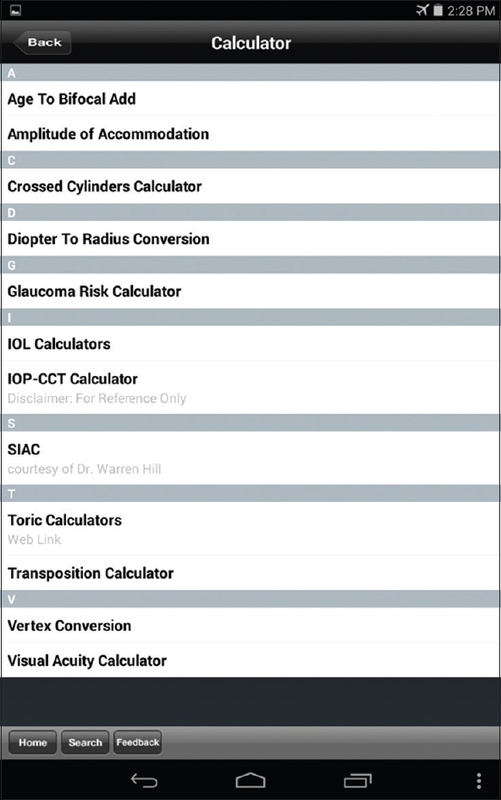 Toric IOL Axis Marker – Apps on Google Play. Available from: https://www.play.google.com/store/apps/details?id=in.hammerapps.jetmed&hl=en. [Last accessed on 2018 Jul 20]. Via Opta Simulator – Apps on Google Play. Available from: https://www.play.google.com/store/apps/details?id=com.novartis.visionsimulator&hl=en. [Last accessed on 2018 Jul 20]. Vision Loss Simulator. Available from: https://www.versanthealth.com/visionloss/. [Last accessed on 2018 Jul 20]. Goh RL, Kong YX, McAlinden C, Liu J, Crowston JG, Skalicky SE. Objective assessment of activity limitation in glaucoma with smartphone virtual reality goggles: A pilot study. Transl Vis Sci Technol 2018;7:10. Paudel N. Smartphone applications for amblyopia treatment: A Review of current apps and professional involvement. Telemed J E Health 2018; doi: 10.1089/tmj.2017.0220. [Epub ahead of print]. Eye Know Tamil – Apps on Google Play. Available from: https://www.play.google.com/store/apps/details?id=com.fundazone.eyeknowtamil&hl=en. [Last accessed on 2018 Jul 20]. Eye Know Bangla – Apps on Google Play. Available from: https://www.play.google.com/store/apps/details?id=com.fundazone.eyeknowbangla&hl=en. [Last accessed on 2018 Jul 20].